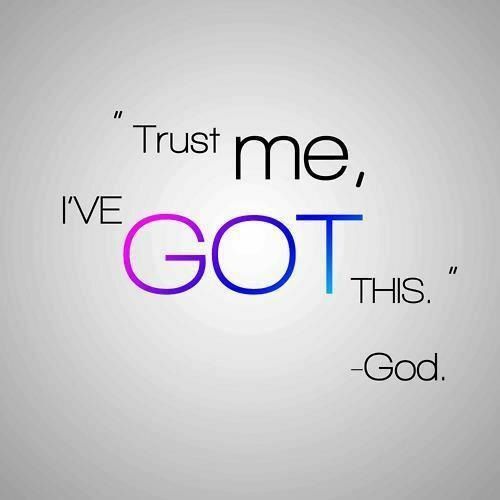 Message From God: I’ve Got This! Core scripture: “And we know that God causes all things to work together for good to those who love God, to those who are called according to His purpose” (Romans 8: 28). Message: I was perusing the shirt section of Mardel, searching for the easy tap-in-putt sure shot gift that my wife had requested for her birthday. Of course my boys kept saying stuff like, “Daddy, get her the shirt of Jesus stomping on Satan!” But I knew the “I love my husband” shirt was what she craved. Now wait, don’t hate on me yet! I have the matching “I love my wife” shirt in my dresser. We just don’t wear them on the same days. Too cutesy. I digress to my point of mentioning this story … amidst the rows of shirts on display, a simple black shirt with bold white lettering caught my eye. It’s message was so simple. How’s that for a comforting thought? It makes me think of the little things that get me down throughout my day. My students forgetting to push their chairs in … me having to repeat myself just having stated the exact same information (Alright, class, the homework will be due tomorrow. Question? Yes, Johnny … yes, the homework will be due tomorrow just like I said about 15 seconds ago. Nothing has changed.) … the kid who simply can’t find his seat because his meds have worn out … the kid who says they couldn’t get the homework done because their wi fi went down when you could pretty much bet your life they simply didn’t do the homework … the pile of papers to grade that seems to multiply like gremlins on your desk. Yeah, we’ve all been there, haven’t we? Then there are more serious issues that plague your thoughts through the day. The test results that show a complete lack of understanding after you thought you nailed the big lesson … the kid who spends a week in the hospital because of self-harm issues … the kid that comes through your door and says his weekend was horrible because his dad tried to hang himself … how about the kid you meet that says he didn’t get the best night sleep because he lives in a tent down at the lake … the kid that dozes off in your class with his head down, showing complete apathy, but when you look into his eyes through the eyes of Christ you see a young man hiding behind any one of numerous possible problems. The sad thing is that all of the above stories have been telling points in my school year so far. My life? I’m great actually. I haven’t felt this good since a long while. But there is something about the students I’ve encountered, not to mention a few faculty members here, that says they need prayer. Bad! This blog is not so much for me but for them. Actually, scratch that because if your life is smooth sailing like mine, it is a simple reminder that we’re not all that lucky and we need to keep everyone in prayer. “Rejoice always; pray without ceasing; in everything give thanks; for this is God’s will for you in Christ Jesus” (1 Thessalonians 5: 16-18). I suppose that verse hits us all. Is it easy? Heck, no! But whoever said being a Christian was easy? Let’s probe a bit deeper. Do you trust Him? Do you truly know that God’s got this? Do you know that even though His will for you will be beyond your understanding that His will is also perfect? Too many times I get caught up in what I think is best. What I want. Maybe even mixing in worldly standards. God’s Word crushes those thoughts when Paul writes, “And do not be conformed to this world, but be transformed by the renewing of your mind, so that you may prove what the will of God is, that which is good and acceptable and perfect” (Romans 12: 2). His will for you is just that. Perfect. No questions asked. When I reflect back on my life and think of the thousands of moments that God led me through hard times only to see me through to the other side, it makes me relish His perfectness. You may not understand at the time you’re going through it, but in retrospect later, you realize the core truth: God’s got this! I don’t know where you are right now, but know this: God does indeed have a plan for you. His plan may not always line up with your own plan, but His plan is indeed perfect. If he is leading you through deep waters, cling to Him. Rest in His loving arms. Jesus’ words are so alluring when He says, “Take my yoke upon you. Let me teach you, because I am humble and gentle at heart, and you will find rest for your souls” (Matthew 11: 29). Take solace there. If your life is fine and dandy like sour candy (got that one from Ned Flanders on the Simpsons), praise God for His blessings, but be sure to lift up those who are hurting. Pray with boldness, knowing that whatever phase of life you are navigating, He is in control. Challenge: Take a moment and think about the numerous times God has pulled you through adversity. Write them down. Next to each one, write how God was your guide for each event. This past week I had a mountain of narratives, main ideas worksheets, and bell works to grade. It was quite overwhelming, but I began to think of the problem through God’s eyes. His voice was inserted in my heart: I’ve been here before. I’ve conquered it umpteen times before, and through time management in chunking these papers, I will get them done. Last Sunday afternoon, as I graded my final bell work, I smiled and pumped my fist. God had that one too! Prayer: Lord, how many times in my life have I doubted you? How many times will I flounder, wondering where you are? Help me realize the truth, that you are with me every step of the way, and that most importantly, You’ve got this. Amen.